The villa in Tuscany is the perfect place for relaxing summer holidays and romantic honeymoons. How many villas in Tuscany this villa is perfect for nature lovers of relaxation and nature. The villa has a rooftop swimming pool for exclusive use. 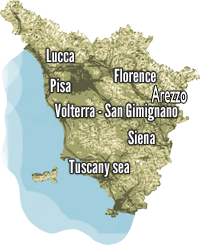 Divina Toscana offers you the chance to visit the most beautiful cities of Tuscany and of the more unusual paths. Our guides will explain the charm and history of the cities, creating a personalized tour according to your curiosity. Suggestions for weekend in Tuscany. The cooking classes are becoming a real cult, after decades of frozen foods and fast food is spreading again the pleasure of eating foods “homemade”. Villa in Tuscany a few minutes from the spa of Casciana Terme consists of large lounge, fitted kitchen, 4 double bedrooms, 4 bathrooms with tub / shower. The villa is on 2 floors, has a large garden and barbecue.